Well, it finally happened. Late last week my 16 year old son came to me and said "Dad, my HP Laptop won't boot up". Wonderful. I went to his room to check it out and sure enough the machine was just continually cycling on startup. It would get to the Windows logo and display the progress bar, suddenly show the briefest flashes of a blue screen (so fast it was unreadable), then the reboot and start the process over. I tried doing a safe boot with each of the types available in the Windows boot menu but no luck. I suspect that the hard drive on the machine had started to go and that a key driver file had become corrupted. I played with it for a while but my efforts were half hearted. This machine was a hand me down from my wife, one that had been a bit flaky in the past. His was the last operational Windows machine still in use in our house. As I looked down on the HP endlessly flailing through the startup sequence a small smile formed in the corners of my mouth. I could finally be done with supporting aging Windows machines, at least the ones parked in my house. I would get him a Mac of his own. Since he's a Junior in High School any machine we got him would likely be carted off to college in a year and a half. There may be another generation of MacBooks before that happens (or at least a minor refresh) so I decided to go another way. I bought him the entry level Mac Mini, rationalizing that it would be plenty powerful for his basic needs. I figured that in a year and a half I'll buy him a new MacBook and claim the Mac Mini as a media center machine. Besides, I already had plenty of accessories around the house. With a strategy in mind I headed off to the local Apple store and bought the machine, a 2.0 GHz system with 2GB of RAM and a 120GB hard drive. I brought it home and hooked it up to a 22" Samsung widescreen display I had from one of my previous PCs (now deceased) and let him use the full size Apple keyboard and Mighty Mouse I got with my Mac Pro. I had a spare 120GB hard drive sitting around from my original MacBook after I upgraded it to a 320GB drive. A while back I picked up a small USB enclosure for it so that I could use it as an external drive; that became his Time Machine device. He's had an older Logitech subwoofer 2.1 speaker system that generates some really decent sound so he's got everything he needs to listen to his music. The last piece of the setup puzzle was installing iWork '09, for which we have a family license. I turned the machine over to him with a couple of quick pointers: don't just click the close button on an application's window, click App Name / Quit. I also explained the Dock bar and the basic concepts around the Finder and how to use Spotlight. While my son can touch type incredibly fast he's really not all of that into his computer; it's mainly a tool for accessing his music, the web and writing up papers for school. When he first started using it he immediately set about doing multiple things at once: updating the music library in GarageBand (adding in the 1GB worth of stock music from Software Update), adding his music collection into iTunes from it's temporary home on my internal server and actually listening to music at the same time. These little tasks seemed to bring the Mac Mini to its knees, making it slow to respond. I introduced Davey to spinning beach balls. I told my son to slow down a bit and not spend too much time exploring the machine to form an opinion while it was doing such intensive tasks. Once GarageBand had finished updating the Mini started to perform at an acceptable level. A couple of hours after he started playing with it he called me over to tell me that it was reporting he was out of disk space. Huh? How could he be out of disk space so quickly? Sure, it's only a 120GB hard drive but sheesh, he had over 75GB free when I gave it to him. My collection—which is over 100GB in size—was being added to his local hard drive and he was blowing out his remaining disk space. In addition Time Machine had started a cycle and he nearly blew that drive's space out as well. Since my Mac Pro holds my music collection and it's always on he didn't need to have local copies of the music in order to listen to it. We changed the above setting, deleted the local copy of the music then re-added everything and it worked great. I also ended up erasing the Time Machine drive and starting that over. After another couple of hours everything was back to normal and running very nicely. My son is completely into GarageBand. He is by far the most musically inclined of our house and is a pretty decent guitar player. At some point in the near future I want to get his electric guitar hooked up to his Mac Mini so that he can incorporate his own music into his GarageBand work. I have no experience at all with that so if someone has suggestions on the best way to proceed please drop a note in the comments. Of course Macs have personality and I'm fond of coming up with Star Wars themed names for our computers. In this case I decided to break from my standards and use a name that also acknowledges my son is named after me. His new Mac is named Mini Me. My wife has been using her new Mini all weekend and seems to have taken to using it just as well as her old Windows machine. It really isn't all that different from what she had with XP. That system never really had problems other than a failing video card that I replaced, so support was never an issue. My wife was involved in most of the setup process, which is a first for her with any computer. I handled moving the data from XP to the Mac myself, since that's a one-time thing. Extracting email, contacts and calendar from Outlook Express and Outlook (she was using both) was more tedious than it should have been. At least there are various ways to extract it using various free programs on the web, though. My wife would never have figured it out herself, though. The Mini is much quieter than the old tower system. Her mother, visiting over part of the weekend, really likes the new Mac keyboard. My wife prefers her thumb-ball mouse, so I didn't get a Mighty Mouse (I hate them, myself). I'm happy that we finally have a more reliable backup for her computer and don't have to worry about anti-virus anymore. @Keleko: I personally detest the Mighty Mouse which is why I figured I'd give it to Davey to try out. He seems fine with it so far. And yes, that Mini is blissfully tiny and quiet. When my parent's computer died beginning of this year I finally was able to get my whole family on Macs. I have been the family text support for years. My brother bought a macbook a little over a year ago, so moving my parents to the Mini this January made my life that much easier. Neither of them are very technically inclined (it was probably a year beginning to end before my Dad could boot the computer, login to out internet service, and get to ebay which was his sole reason for learning to use the computer in the first place). My Mom is doing great, but I think she has some "carry over" from her iPhone she got in July. I have been extremely pleasantly surprised with the ease of the transition. The live 600 miles away so I talked my Mom through the process of the first boot and set up on the phone until she was logged into iChat with an AIM account I created for them. Then we screen shared and with just one hour or so of tutorial they were off. The only issue they have had was solved by installing firefox. My Dad has trouble differentiating between click and hold and would endlessly bring up the history menu in Safari instead of just clicking back. They have called me several times to ask me to share their screen and show them something, but I knew they'd figure it all out when on the second day I remoted in to help the with something and discovered my Mom had installed games - and stopped asking for non-IE specific time-waster games. I told them an external drive was required and helped them set up Time Machine which is wonderful. When their XP machine died I found out they hadn't backed up anything in almost a year and a half, and then it was only the pictures. They have gotten the Time Machine backup failed error several times but I've told them to only call if it errors twice in the same day and they've stopped calling about it. It always repairs itself on the next try. My brother's transition was even smoother, usually limited to questions of "what software should I get to do X?" and occasionally I teach him a new trick. @Oliver: Excellent - thanks much! Does the Guitar need to be cycled through an Amp before going into the Mac? The Monster site seems to indicate it goes in directly. I'm a noob when it comes to how musical instruments integrate, though I found that microphones need to be amplified in order to be plugged into the Mac's audio input port. You can buy a full-size jack to mini-jack cable or adapter, and plug the guitar straight into the audio in of the mini. Monster makes one that's about $20. Hi David, why don't you activate iTunes library sharing on your Mac Pro? 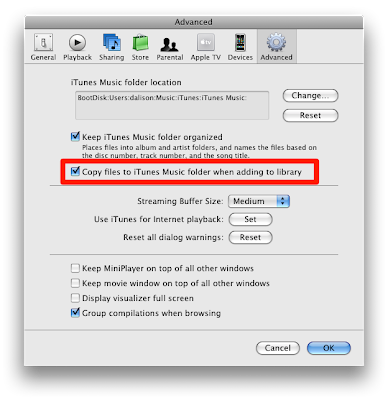 This way your son will be able to access your library from his Mac Mini, without having to add the songs to his library. And he can even let the option "Copy files to iTunes..." on. I believe it goes straight in - I've never tried it personally, but my father is looking to connect his guitar as well and I was doing a bit of research. You just plug straight in to the Mac. GarageBand can even simulate different amps. Very cool! @Mark, Oliver: Excellent - thanks guys! @Fabrizio: I don't keep iTunes running all the time (though I do most of the time) which is why I prefer to have the music files in a shareable area on the network. The same applies with iPhoto, which is one of my complaints with it's sharing model. I've got some experience with guitar/Mac interfaces, DA. Plugging directly into the Mac works, but is probably not the best sound available, although it has been updated since I tried it. Several outboard devices specifically for guitar can be found. I owned for a while a DigitechRP500, which is outstanding and very versatile and includes software for Mac. It works through USB. Excellent live as well. Line 6 (the company) also makes outboard USB interfaces and I've used one of them, too. These all have extensive amp-modeling capabilities and tonal variation. If you want to run a lot of applications like that, you really need 4GB of RAM. It made a huge difference when I upgraded my MacBook from 2GB to 4GB. Unfortunately, the Mac Mini isn't easy to upgrade. @Mike: It wasn't really clear to me whether the Mini is user upgradeable from a memory or hard drive standpoint. The Apple store folks told me it voids the warranty so I decided to let them bump it from 1GB to 2GB. This should be fine for my son since his only memory intensive application appears to be GarageBand. The Mini isn't that hard to crack for drive, RAM etc. if you are used to taking stuff apart. you do have to take a fair amount of it apart, but once the cover is off the case it's pretty straightforward. But there is still the warranty issue. My understanding, though no personal experience here, is that Garageband can be a real memory hog. LOL. The ol' name your computers after your favourite movie. In my last job, since I was the boss, I got to choose. So all our new servers were named after characters from Zoolander. Derek, Hansel, Mugatu, Matilda etc. I love hearing people's naming conventions for their computers. There are a LOT of options for recording. The question becomes whether you want to start off with something cheap or buy something decent and more expandable into more of a real home-studio kind of device. I do NOT recommend just plugging the guitar right into the computer. Sound quality will be bad and then you're stuck if you ever want to add vocals or do live micing of other instruments or from a real guitar amp. There are a lot of good firewire possibilities from brands like Presonus, Alesis and MOTU (more expensive, but my recommendation) that could be the basis for a fun home recording studio. Add a usb midi controller and he's set to go for a while. Garageband is fun. If he starts to outgrow it, though, I really recommend Logic Express. It is a fantastic deal for what it gives you. I just upgraded the memory in my old mac mini from 1gig to 2 and a half. It took ages to get the case off. They don't make it easy. It is my understanding that the warranty remains in place but not for any damage you do to the machine while you're messing around in there. I'd also heard that you need to run your memory in parallel but this site indicated otherwise. A half gig and a 2gig stick run faster than two 1 gigs. Wow David. In just over a year you've gone from a Mac trier to converting the whole house. So how many Apple products do you now have in the house-hold? Not counting my early '90s LCII, I've got a late '06 5th gen. iPod (80GB), an early '07 2nd gen. Shuffle (1GB), a late '07 1st gen. iPhone (8GB), an early '08 4th gen. 17" MBP (250GB), and final an early '08 1st gen. Time Capsule (1TB). Next will probably be an Apple TV. Very cool about completeling the switch to Apple in your house! For your son, DEFINITELY upgrade the mini all the way on the memory and hard drive! Did you get one of the new Mini's? I think the old ones can only go to 2 gigs, but the new ones can be pushed to 4 gigs. Also, for recording, the more memory and hard drive space the better! There are a lot of options out there, including the Line 6 Pods and Studios. @Kermit: It's a bit embarrassing actually; my wife and daughters each have white MacBooks, I have a Mac Pro and a MacBook Pro for travel and my son now has the Mini. We've also got a 500GB Time Capsule and an AirPort Express powering our stereo. Needless to say I'm very happy with what we've got. @David Scheidt: Thanks David; I'm going to hold off on the upgrades for the Mini as long as I can, see how he uses the machine first. I am disappointed that Apple didn't make it as easy to upgrade the HD and memory as they do in the MacBooks though; if they did I likely would have already upgraded it. I have an almost two year old macbook and am currently getting several years worth of mini-DV movies into iMovie '08 (macbook is still running Tiger). The macbook really struggles when iMovie is running - no other apps can be open at the same time. I want to get a more powerful second system but don't want to go to the expense or size of an iMac. Do you know how well the new mini runs when iMovie is open, or even better, when movies are being uploaded/edited? @Jinjir: There are two elements that seem to impact iMovie performance the most: video and memory. Since your MacBook can likely support 3GB (they have only been able to support 4GB for a little over a year from what I understand) you may want to go down that path first to see if it helps from a performance standpoint. If you do decide to go the Mini path then getting as much memory as you can (4GB) will surely be helpful. The video in the Mac Mini—which has the NVIDIA GeForce 9400M—should give you much better performance than you have now. Make sure you look at the total cost though - add in the monitor, keyboard, etc. unless you already have them to make sure you are comparing it fairly to an iMac, which may end up being a better solution for you. I use an EMU 0404 USB Audio interface box. Cheep, and has good converters and can get guitar in and out. I also have rerouted my audio ins and outs through the adapter from my MacBook Pro and things sound great. It was the cheepest/best unit I could find after much research. @Rick Allen: Thanks for the link, I appreciate it. I'm probably going to go with a simple cable directly into the line in port to see how that goes. If he wants to spend HIS money then I'll make sure he checks out the E-MU 0404. When your son is ready to add vocals with an external mic, check out the Snowball. Works great with Garageband. I use the POD Express which is around $60US I believe. Another option for your son is the M-Audio FireWire Solo. The nice thing about this unit is that you can plug in both a guitar and a mic. I have one and use it both for music and just for voiceovers on movies, etc. It plays nicely with Garageband. A Mac Mini is also a perfect machine for a server. Quiet and tiny, it's even better with a couple of 1GB external hard drives. It even works great as a Time Machine server. It saves electricity too. Besides for my use, I've also setup a number of clients this way. No need for a Mac Pro for home/small business needs. The normal version of Mac OS X is fine too. The server version with a Mac Pro is not necessary for such modest needs. Believe it or not, the normal version of Mac OS X is a **much** better Time Machine server than the server version of Mac OS X. The reason is that the normal version of Mac OS X allows multiple hard drives to be shared as Time Machine backups. The server version of Mac OS X only allows only *one* hard drive to backup everything. Strange. Yes MiniMe is the perfect name. I used that name too. The Mac Mini is the perfect form factor for a kitchen cubby workstation... which is exactly where mine is located. It's my favorite computer in the house (and believe me, I've got a small fleet of 'em). I've used the mac mini as a media center for over a year now. Its a fantastic little machine. I also believe the device makes an great server. All too often people over-power their servers and frankly waste electricity. The mini has everything you need and nothing you don't. The newest version of the mac mini also uses far less power, only 11W while ideal! pauses while streaming Youtube. Instead of 3x faster it's 10x slower. The chat room tech at AT&T tells me it is the 10.4 and Safari. need to upgrade! To what? He don't know. I think he became a Honey Badger.